What’s a girl to do? Why, salvage both items, of course. 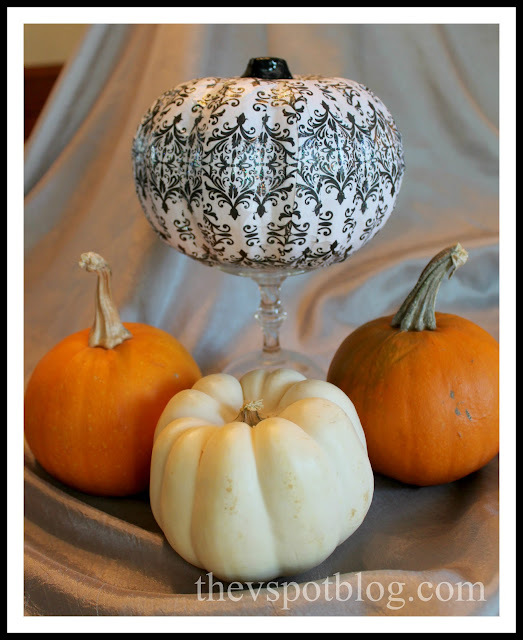 I made a Damask Pumpkin. 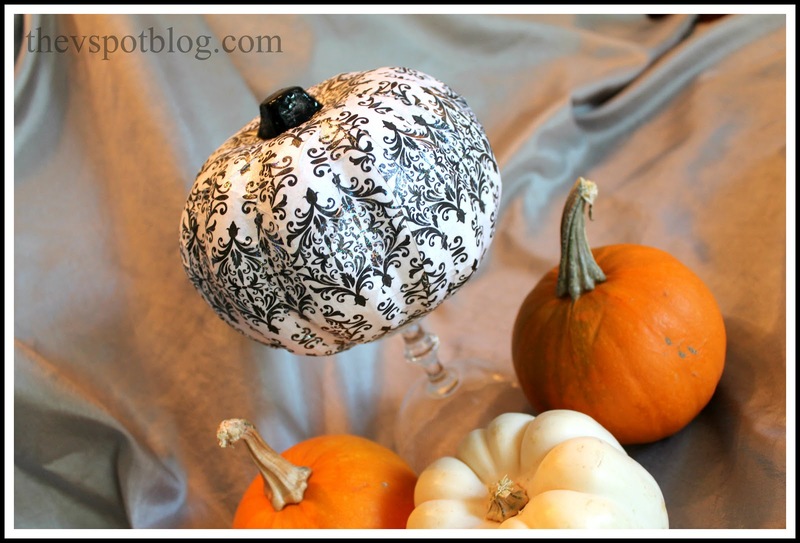 I took that sad pumpkin (which still looked like it had orange mange, even after I cleaned it off), my scraps of Damask print paper and some Sparkle Mod Podge and got started. All of the paper scraps had the same basic pattern, to starting at the top and working my way down, I did my best to line up the pattern as I Mod Podged the paper to the pumpkin. I found that slightly damping the paper strips made them easier to smooth into the pumpkin’s grooves. Definitely a way to make sure that none of my craft supplies go to waste. We like that! It looks really good-I have a craft pumpkin and a whole lot of cut ribbons and I am scared shitless due to perfectionism. Sparkle modge podge may have been the push I needed! I had never used modge podge – I keep look at projects that call for it, but I’m a bit intimidated. But sparkle modge podge, now I may have to cross that threshold. Making a hanging centerpiece for an outdoor Thanksgiving. A transitional floral arrangement: Fall into Winter Centerpiece. Easy pedestal pumpkin for Thanksgiving. Going Batty: Making over a bare wall for Halloween.